The Bolivian Dry South tour offers 500 bird species, with 200 specific to the five habitats explored in this tour: Dry Chiquitania Forest, Chaco, Andean Dry Valleys, Southern Andes, and Tucuman Forest. Bird communities you are not likely to see elsewhere unless you plan to bird Northern Argentina and Paraguay. It is part of our full three part Bolivia tour, between Bolivian Humid lowlands and Bolivian Andes. 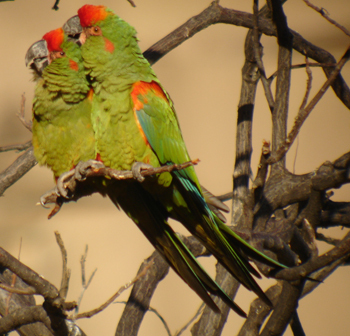 This tour is perfect during Bolivia's wet season (January to April) as there is little rain in the dry areas, but the birds are very active- especially the breeding Red-fronted Macaw. Our tour starts in the Dry Chiquitania forests of the department of Santa Cruz, searching for such habitat distinct birds as the Red-legged Seriema, Greater Rhea, Red-billed Scythbill, Long-winged Harrier, Bicolored Seedeater, and the near endemic Bolivian Slaty-Antshrike (most birders only see this species in Bolivia). We then travel south to the Bolivia Chaco- only shared with Paraguay and Argentina. Many of the birds seen in this habitat by birders are only seen in Bolivia. The open habitat will assist us in getting some great looks, and some rare looks at Chaco Chachalaca, Black-legged Seriema, Larklike Brushrunner, Brown Cacholote, Crested Hornero, Chaco Earthcreeper, and Many-colored Chaco-Finch. We then work our way up the dry Andean valleys, a habitat specific to Bolivia with several ranger-restricted and endemic species. The clear goal is the Endemic Red-fronted Macaw- which we have had a 100% success rate in enjoying at the Red-fronted Macaw Reserve (a conservation project by Asociacion Armonia we are proud to support as the profits go to three local indigenous communities that help to protect the bird- that and the place is marvellous). 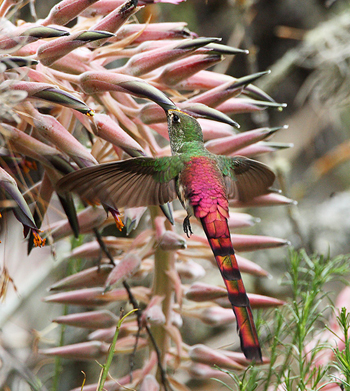 The mild Andean climate, open area and tame birds offer a wonderful birding experience (loved by nature photographers) where we expect to see Andean Condor, Black-chested Buzzard-Eagle, Mitred Parakeets, Yellow-chevroned Parakeets, Blue-fronted Parrots, Red-tailed Comet, Giant Antshrike, Fawn-breasted Tanager, the other Pampa Finch, Bolivian Warbling-Finch, White-eared Puffbird, Greater Wagtail Tyrant, White-tailed Plantcutter, and Ultramarine Grosbeak. From here we travel further up the Andes to a wonderful cloud forest to give you a taste of Bolivia's Andes.